Here we are, kiddies. It’s the final issue of the Scott Snyder’s intense “Death of the Family” storyline. All in all, I don’t feel like I should say too much. It’s one of those things that I think everyone should take it in on their own and immediately text their closest nerd buddies or run to the LCS and gab with Marge behind the counter or that one creepy guy that hangs out a little too close to the “adult manga” section. Either way, I suppose I can give the overview. Joker has captured all of those closest to Batman: his friends, his family, and even Batman himself. It’s safe to assume that Joker is finally going to make good on his promises of the Bat-family dying by the hands of Batman himself. But Batman figured out exactly where they were being held and stormed the gates of Arkham Asylum to rescue his partners and loved ones from The Joker. And now, Batman sits around a table with those he came to safe and Joker finally reveals exactly what he has done. To say that Joker is proud of what he has done would be a massive understatement. 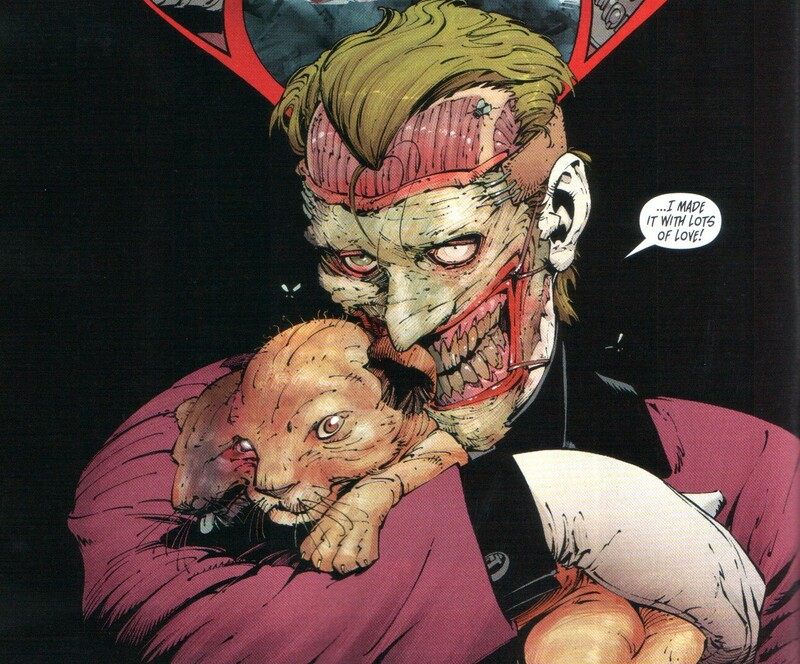 We’ve seen enough of the Joker over the last 70 years to see what he is all about, and we’ve learned so much more about him over the last 5 issues. 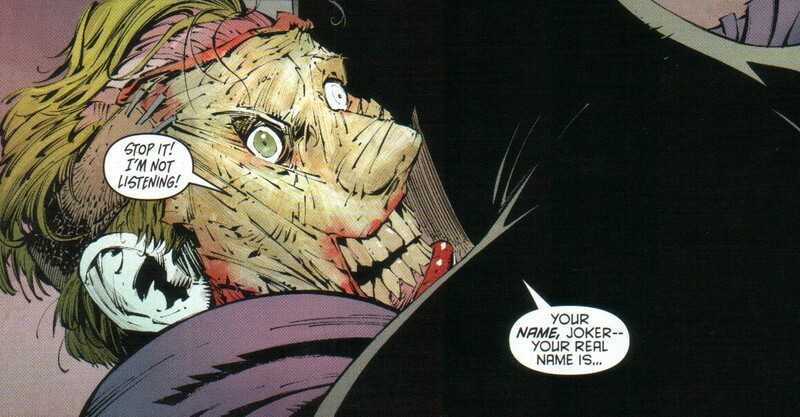 Regardless of what changes in continuity, one of the things that will never change is Joker’s sick set of sensibilities. 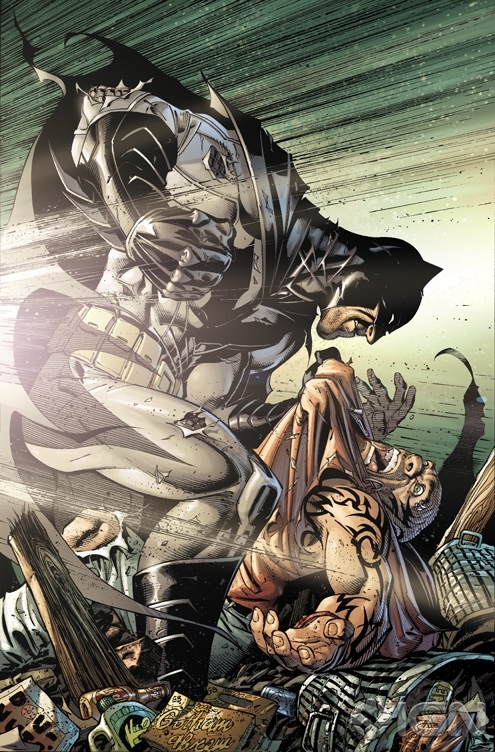 Of course, Batman manages to free himself and the others (not without a fair amount of damage done to everyone) and pursues the Joker into the depths of caves. It is there that they have their final confrontation of the storyline. Batman grabs Joker and, after a chat about Joker trying to show Batman what everyone is beneath their masks and faces, Batman threatens to tell Joker the one and only thing he never wants to know: Batman tells Joker exactly who he was before he was twisted into the Clown Prince of Crime that we’ve known for decades. Turns out, Batman’s known all along. I really can’t say much more about the issue, out of both respect for the work itself and the fact that it’s way too dense to cover here. It would take more time and space to almost adequately convey what happened here than it did for Snyder and Capullo to execute it perfectly. Suffice to say, it’ll absolutely get people talking. And it might be hard to swallow who dies and who survives. I’ll be the first to admit that I was really surprised, but it’s amazing to see that, regardless of the outcome, Joker will always have the last laugh. Snyder’s been talking about ideas for a large storyline starring the Riddler after “Death of the Family” wraps up. Of course, I haven’t been able to find too much in the way of official announcements or DC solicitations, so I really can’t go on the record or pass along any helpful info. I can say that Snyder and Capullo have both verified they’ll be around for at least another year, which is absolutely fantastic if you ask me (and about 98% or more of the Batman fans out there). Batman will return next month in issue #18, a supposed continuation of filler storyline in issue #12 featuring new-comer Harper Row. The issue features Scott Snyder on story and guest artist Andy Kubert in place of Capullo for the month. Greg will return on pencils in issue #19. And for those of you that may be concerned with Kubert’s style and how well it will fit in with the gritty feel of Batman, here’s a special preview page of Andy’s work from issue #18.